The Unification Church(Rev Moon)-controlled Washington Times is claiming that DC Police have spent $3M because of the DC Ferguson protests. 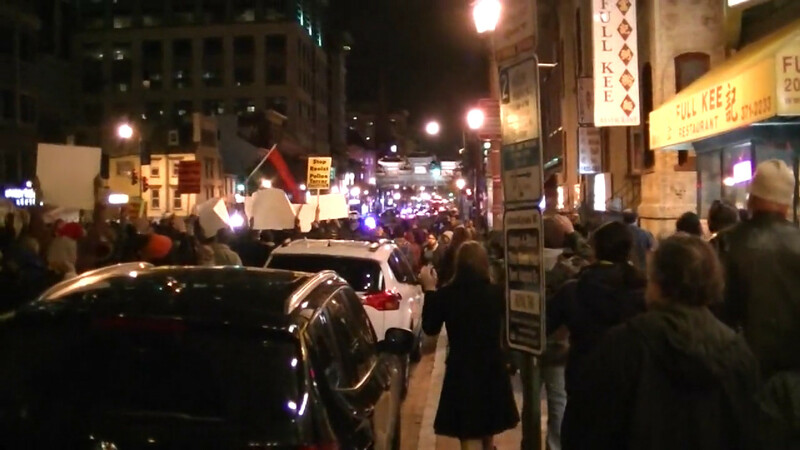 I can say from personal experience that this consists of following DC Ferguson protests through the streets and redirecting traffic to isolate protests. Perhaps police chief Cathy Lanier should think of this as a $3M fine against the DC Police for violating the rights of African-American city residents with jump-out tactics and illegal searches stemming from them. 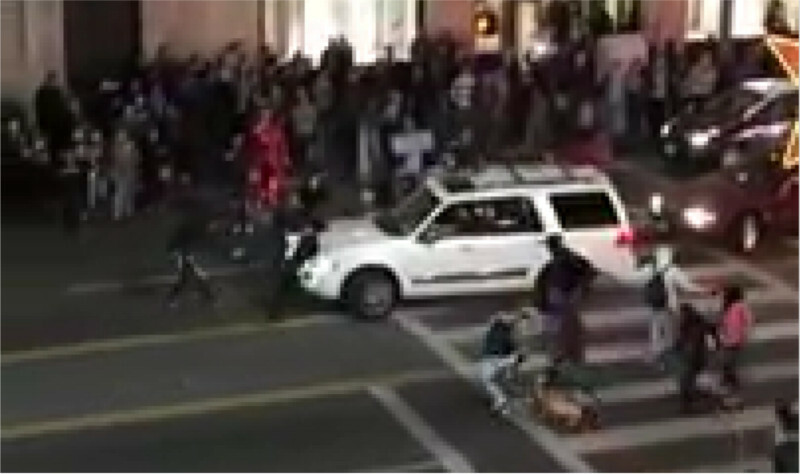 On the 29th of December, video emerged on Youtube of an SUV driver in LA ramming his truck through a street blockade set by Ferguson/police brutality protesters. One protester was left seriously injured. 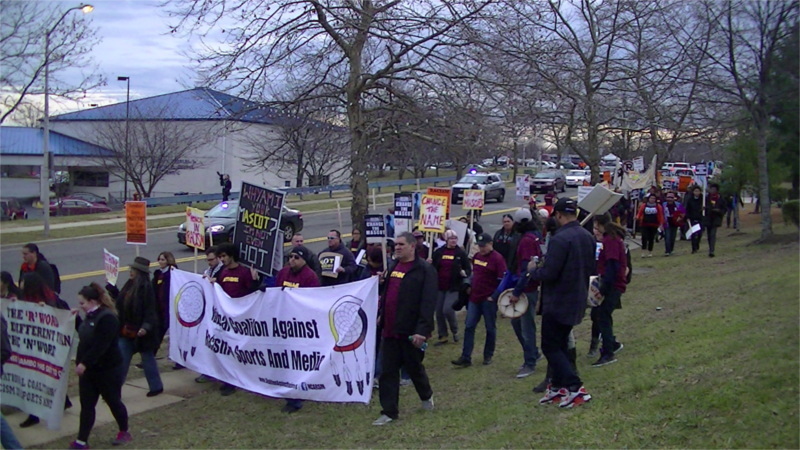 On the 28th of December, Native Americans and allies from many communities marched on the final home game of the Washington Football Team. The demand was simple: that the team change their racist name and mascot. The name originated as a reference to bounties paid to mercenaries and vigilantes for the scalps of murdered Native American men, women, and children. At one point the bounty reached $200-in 1800's dollars. To this day it is still deemed "culturally acceptable" to treat Indigenous people as "unpersons," according to multiple rally speakers. Thus, this is the one time the use of racist names and mascots in sports is still widely accepted. 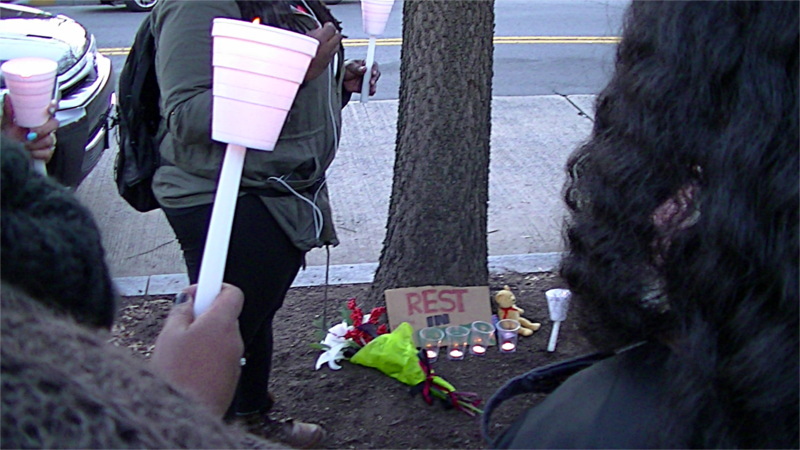 On the 26th of December, a vigil was held at 28th and Naylor Road (Anacostia), for 29 year old Raymond Robinson, who was shot and killed by DC Police on Christmas Eve. Police claimed he fired on them, but multiple witnesses said police fired first. Not long after the vigil, a man in a neighborhood Watch T-shirt desecrated tbe memorial. The memorial set up at 28th and Naylor-reads "Rest in Power"
Video of political protests and activsm spanning 2014 in Washington DC and elsewhere. The biggest campaigns have been tar sands(and the Keystone XL), fracking (and gas export at Cove Point), the Palestine War and above all else Ferguson and police brutality. Also action against the TPP and TTIP trade deals and for net neutrality, and who can forget the massive People's Climate March in New York. 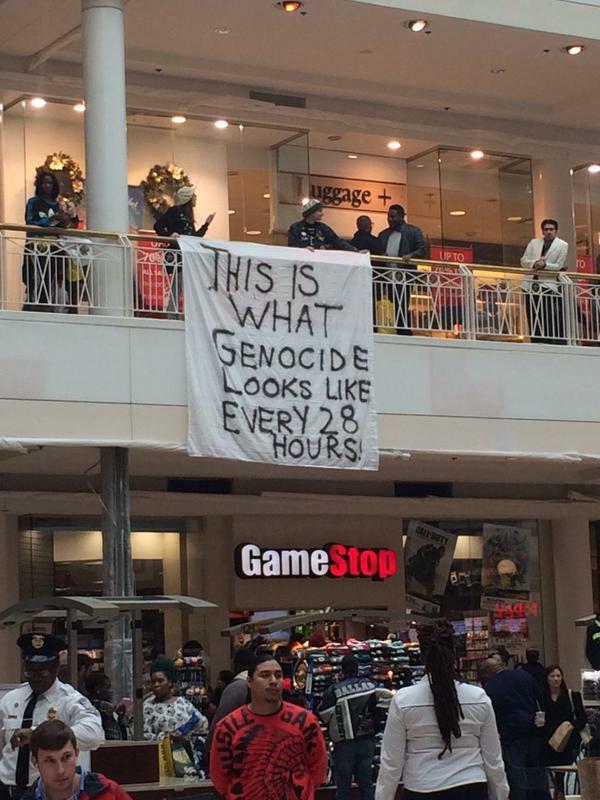 On the 24th of December, as shoppers raced to buy their last Yule gifts, civil rights protesters from DC Ferguson stormed the Pentagon City shopping mall and aparently shut down some of the shopping. Shoppers stood watching the protest, their minds diverted for the moment fromm spending. This is the second time DC Ferguson has occupied Pentagon City. Meanwhile, NBC News reports DC police opened fire on a man at 30th Street and Naylor Road SE and killed him. Police said he "matched a description" of a robber and fired on them first, but at least one eyewitness reports it was the police who fired first. 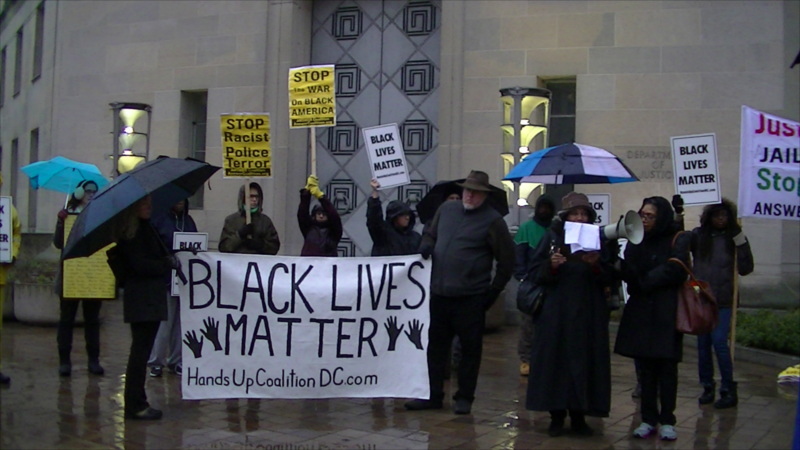 On the 22nd of December, Hands Up Coalition DC gathered outside the US Dept of Justice to announce that there would be no moratorium on protests against killer cops. NY Mayor DeBlasio has attempted to demand such a moratorium, but protesters are telling him he can have it any time he wants by imposing a moratoriom on cops shooting, choking, and otherwise killing people. One woman said she wanted the DOJ and the White House to show the same concern for "our children" who are being gunned down by the police as for the police who were killed, and only then could there be a moratorium. 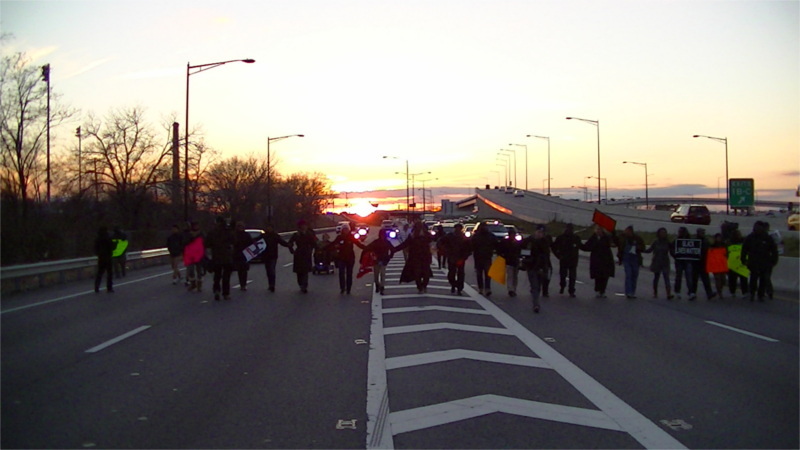 On the 19th of December, on 4 hours notice, civil rights protesters assembled in Anacostia,marched onto the 11th St Bridge, and held traffic. From there they marched onto DC 295 and blockaded traffic, though not holding any one line of cars directly for more than a few minutes. The cops themselves blocked traffic far longer, but the entire freeway action was deliberately limited to one hour. Local participants were nervous about mass arrests, so organizers reminded everyone of DC's "3 warning" law for arresting protesters. 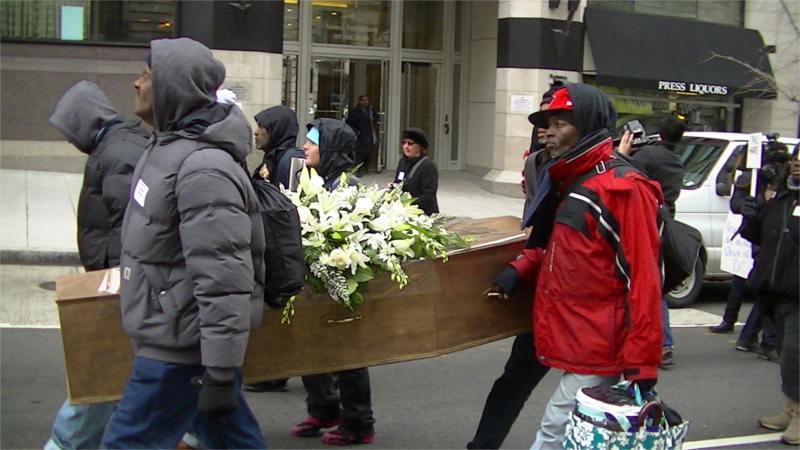 On the 18th of December, DC homeless folks and their allies gathered at Mitch Snyder's gravesite, then marched to Freedom Plaza to an all-night vigil for those who have died on the streets while homeless. 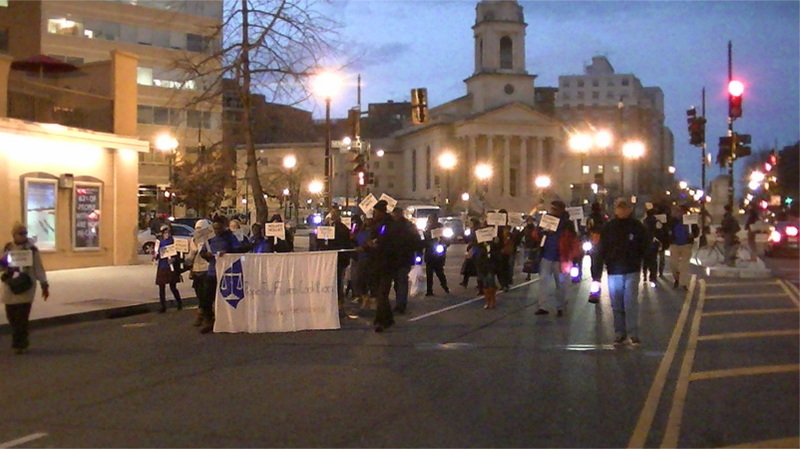 Many carried signs bearing the names of people who died on the street. At the vigil a casket is set up in a tent representing those who have died, it will be marched up to Mitch Snyder's grave site on Dec 19. On the 18th of December, Twitter posts tagged with #dcferguson disappeared from Twitter searches unless "top" was selected instead of "all." Since "top" stories are old, this made it impossible to use Twitter to call protesters to assemble at a short notice time and place. Twitter themselves or right-wing/police hackers could potentially do this. For several days before this, a #dcferguson Twitter search would return large numbers of "falabeats" audio promos, and finally returned a half dozen pages of those posts at some times on Dec 18, burying almost all other posts.